It started so well back in 2001. Apple’s jukebox software was built on the third-party SoundJam which it bought the year before, and was a slick, quick and easy-to-use music player for a long time. Then Apple decided that iTunes should be the conduit for the iPhone, and kept piling on bloated features. What had started as a pared-down, single-minded and simple application started to sync with Outlook, gained the useless cover flow view and, on the Mac at least, appeared to have a monopoly on the spinning beach-ball of death. Worse, the iTunes Store, a fantastically user-friendly music store, gained weight in the form of the awful, hard to navigate App Store. Of course, these days we have a new, simple and fast music app. It’s called Spotify. Apple, though, has shafted itself. The problem with selling a revolutionary device which is an iPod, a cellphone and an internet device, all in one, is that the software to support it needs to be similarly multitasking. Anything we missed? While these failures are big, we have restricted them to the modern-day Apple, and ignored the Jobs-less wilderness years of beige boxes and overpriced printers. – OK. My thoughts are as follows. iTunes has become a cumbersome product that is becoming more and more confusing. This is coming from a guy that takes pride in knowing his technology and keeping up with all the latest trends. Would it hurt my mac dock to have additional application lingering? No! A dedicated team for a piece of dedicated software would also be nice. 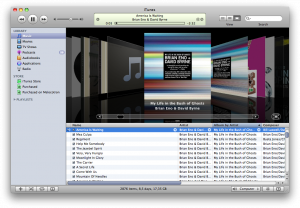 I find iTunes sometimes clunky and a little over bearing. At the end of the day, I do not have too much to complain about. I love Apple! Feel free to add more in the comments. via iSuck: Apple’s Five Worst Products, Ever | Gadget Lab | Wired.com.